Having its important landmarks and gorgeous buildings bombed and flattened during World War II did not stop Dresden from becoming an awe inspiring vacation destination. Known as “Florence at the Elbe,” Dresden has rebuilt its baroque style buildings in all their glory due to its fantastic location on the banks of the Elbe River. Get engulfed by the beauty that Dresden holds in its phenomenal museums, beautiful architecture, art treasures and enchanting landscapes. All of those will offer tourists various things to do in Dresden. Dresden Christmas Market is actually 4 markets in one. Each having its own unique theme and size, they span what is called the “Christmas Mile.” The Market is open through advent. On the first Saturday of advent, it holds its Stollenfest where you can see an 8’ x 12’ loaf of its famous holiday (stollen) bread paraded through the city to the main Christmas market at Neumarkt. You will not want to miss out on the fantastic shopping and festivities held at these markets. 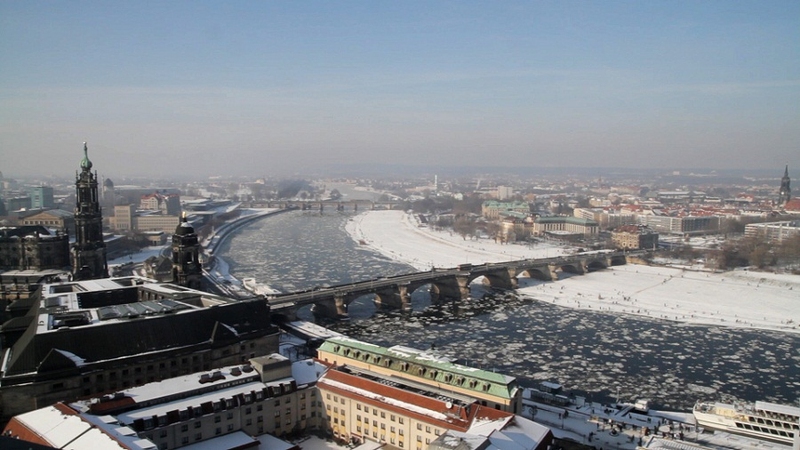 The Elbe River flows down the middle of Dresden, past Dresden’s Old Town and splits the city in two. You can experience beautiful views of the city from its banks. As you stroll down the banks, you can watch this watery street come alive with ships as they travel through the city. In the summer you can join the locals on the grassy lawn as they enjoy movies at one of the largest outdoor theatres in Germany called the Dresdner Filmnaechte. The Elbe River banks also provide a peaceful place to stroll during the winter months. One of the best things to do in Dresden is to take a view from the Church of Our Lady. 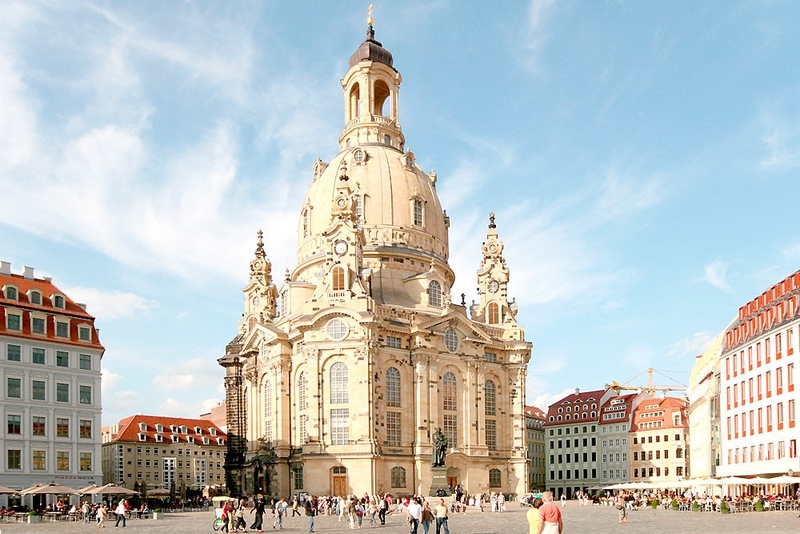 Since its resurrection in 2005, Frauenkirche has become the signature landmark in Dresden. During World War II, it was blown into a pile of rubble which remained for 40 years until people around the world privately financed the rebuilding using the original plans from 1726. With the use of the charred stones and new stones, it has become an architectural history of the past and present. Along with viewing its beautiful murals and exceptional architecture, you can climb to its cupola and have a breathtaking view of Dresden. One of the finest art museums in Dresden, the Albertinum was recently redesigned in 2010. The new design allows for it to showcase two main galleries. The New Masters Gallery (Neue Meister) showcases modern painters from the 19th and 20th centuries, including Van Gough and Monet. The Sculpture Collection (Skulpturensammlung) holds pieces ranging from the classics to modern sculpture. The Green Vault houses one of the finest royal treasure collections in Europe. During World War II the treasures were removed to keep them safe, after the Green Vault was rebuilt in 2004 they have returned home in all their glory. The vault is located in the Dresden Palace and was first introduced to the public in the 18th century by August the Strong. You can view the intricate works of the jewelers and goldsmiths as well as other precious objects of gold, silver, gems, enamel, ivory, bronze and amber. While you are there, don’t forget to view the largest green diamond in the world. Enjoy a relaxing afternoon as you glide down the Elbe on a historic paddle steamer. You can indulge yourself with German cake as you take an afternoon “coffee cruise.” You can also take a ride down the river to treat yourself to some porcelain in the town of Meissen, or take in the scenery of Saxony Switzerland as you coast along the river on one of the historic paddle steamers. Speaking of things to do in Dresden, you can just take a walk along the Brühl's Terrace. Before it became the garden of the royal palace, Brühl’s Terrace (Brühlshe Terrasse) was part of Dresden’s original rampart. This beautiful terrace lies between the river Elbe and the Old Town, which makes it the perfect place to take in some of Dresden’s gorgeous historic buildings as you stroll along the banks of the Elbe. Known as “The Balcony of Europe,” it is home to a monumental staircase flanked by bronze statues. Enjoy an evening promenade or a relaxing walk during the day. The only opera house named after its architect, the Semper Opera, is home to the Sächsische Staatsoper Dresden. The people of Dresden are very proud of their Opera as the tickets are sold out all year, if you want to purchase a ticket, you must book at least a year in advance. The plaza outside the opera house is a fantastic starting point for a walking tour of downtown Dresden. You may also take a guided tour of the history and acoustics of the Semperoper, in either English or German. Located next to the Semper Opera House, Zwinger Palace once served as the orangery, exhibition gallery and festival arena of the Dresden court. 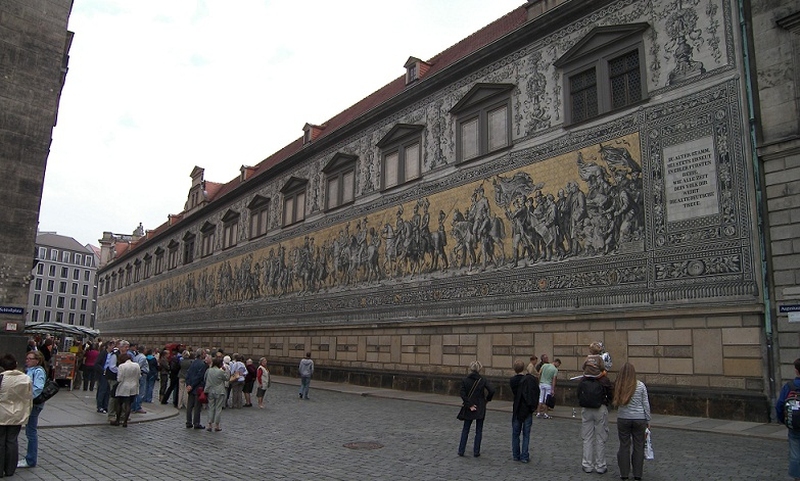 It is now beautiful collection of museums that houses the Old Masters Gallery (Alte Meister) full of Baroque and Renaissance art, the famous Dresden Porcelain Collection and the royal cabinet of mathematical and physical instruments. While visiting the museums, take in the view of exceptional architecture from the Nymph’s Fountain. Enjoy your lunch or dinner on a patio, deck, under the stairs or on the lawn of your new favorite restaurants. The Fauenkirche is surrounded by outdoor dining experiences. Join the locals as they drink coffee or beer and enjoy the local cuisine while having a breathtaking view of the Fraunkirche.